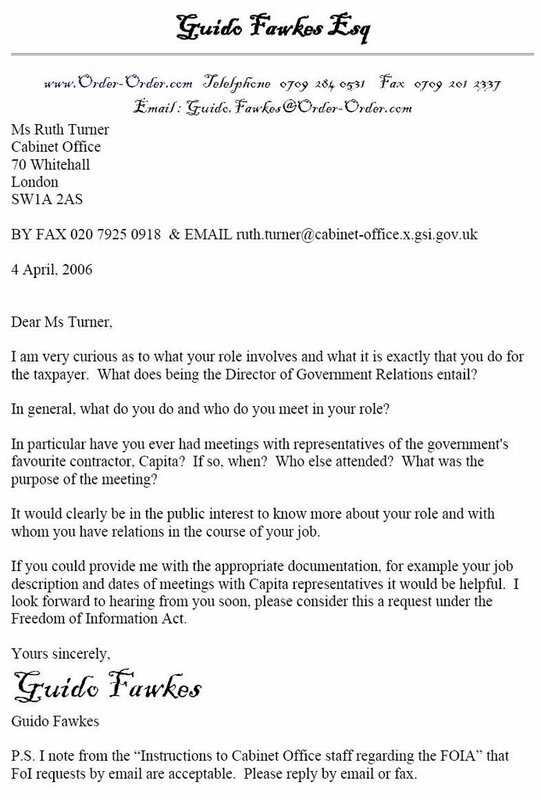 Guido has just spoken to the Cabinet Office regarding his public interest FoI request about Ruth Turner’s job specification. Difference of opinion on how many working days since the 4 April have passed. They say it is due tomorrow, Guido reckons today. You say tomayto, Guido say toomarto. Now Guido has heard a rumour that Ruth has apparently had no meetings with Capita representatives since becoming Director of Government Relations. So you might ask who does Ruth relate to on behalf of the government if not their biggest contractor? The request is for her job description. What does she do? Is that a state secret? All will be revealed (or not) tomorrow. Unhelpfully they would not say if the response will be substantive or “sod off”. Given that they are needlessly dragging it out as long as legally possible suggests they are not that so keen on openess and transparency.